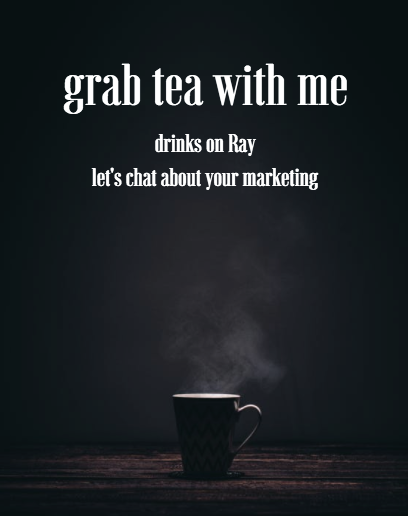 Grab Tea with Ray and schedule your consultation today! Need a new fresh look at your business? Looking to step up your game and develop a BallR game plan? In your consult we'll tackle any issue you may be facing as you start your business and it continues to grow! 1. Pre-Consult Questionnaire - this a series of questions you answer prior to the meeting or print out and bring with you to help narrow down exactly what your needs and goals are! 2. A Social Media Audit - going through your current social media channels together and seeing where it currently stands to begin accessing what changes we need to make (posting times, days, voice, demographic, etc). 4. Strategy Session - This is the most intense portion, it's where you unlearn some of your marketing habits, where we create a new strategy based off your target demographic, figure out keywords, and a posting schedule. 5. Social Ads - do you want to create an ad, lead generation, learn how to boost a post, or create a like campaign? You'll learn how to do all of this!